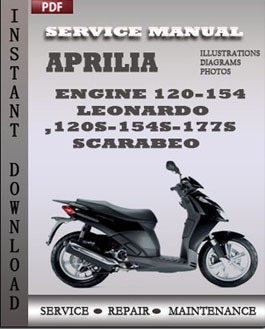 Workshop manual pdf download Aprilia Engine 120-154 Leonardo 120s-154s-177s Scarabeo along with hundreds of photos and illustrations, that guide you through each service and repair procedure. Not a scanned Workshop repair manual. Workshop Repair Manual Aprilia Engine 120-154 Leonardo 120s-154s-177s Scarabeo for instant download in format pdf.Digital Workshop Repair Manual contains everything you need to repair, maintain, rebuild, or restore your vehicle.